The IS-7 is back On Track! Get some "face time" with the enemy in this tier X Soviet heavy tank -- it's got a well-armored upper "pike nose," matched with incredibly thick and well-sloped armor in key points. The IS-7 excels at short and mid-range combat, and can take an immense amount of punishment as it leads the charge or holds a strongpoint in style. If you're a fan of firepower, give it a look: the IS-7 brings a massive 130mm naval cannon to the fight! 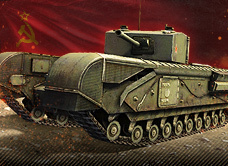 You've also got the chance to earn the earn the tough, fast-firing Churchill III heavy tank, perfect for training Soviet heavy tank Crews while earning piles of Credits! Damage two or more enemy vehicles in a battle. Complete On Track to the IS-7 four times. Complete On Track to the IS-7 eight times. Complete On Track to the IS-7 10 times.